– Damage occurs to axons or myelin surrounding peripheral nerves. 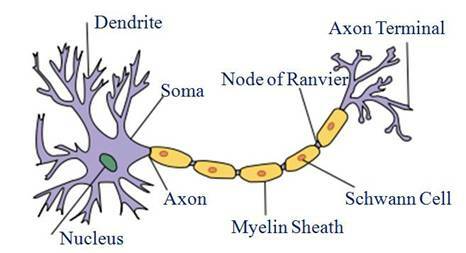 The axon is the “fiber-optic cable”of a neuron for transmitting messages from neuron body (soma) to make contact with other cells - usually neighboring neurons but sometimes muscle or gland cells. ✔ Sensory (afferent) nerves from body. Receive and transmit sensations from the parts of the body to the brain, E.g. heat, pain or touch. ✔ Motor (efferent) nerves to muscles. Send messages from the brain to the muscles to control movement. ▪ Impair any involuntary function - depending on location of damage.